Since your Registered Retirement Savings Plan (RRSP) matures on December 31st of the year you turn 71, you will likely convert it to a Registered Retirement Income Fund (RRIF). You can see a RRIF as an extension of your RRSP. As with your RRSP, you can continue to manage the investments in your RRIF. Like an RRSP, the growth of investments held within a RRIF is tax-deferred. What is an RRIF and how can you use it? A RRIF is funded by rolling your RRSP funds into the RRIF on a tax-deferred basis. You can then use the funds in your RRIF as an income source for retirement. Other than conversion to a RRIF, the other two options Canadians have when an RRSP matures are: simply cashing in their RRSPs (not a popular option as the entire amount will be taxed as income, often at a high rate), or buying an annuity. Annuities pay a pre-set amount of annual income over a period specified in the annuity contract. Holders of annuities are taxed on the amounts they receive annually. You are able to receive RRIF payments every month, every quarter or annually. Or you may choose at some point to receive a lump sum payment. There are no maximum limits placed on RRIF withdrawals. However, under the Income Tax Act (Canada), annual minimum withdrawals are required starting after the year that the RRIF is established. Some RRIF holders choose to take only the minimum payment to take advantage of continued tax deferral. Conversion to a RRIF provides the opportunity to review your asset mix with your advisor. Do you have the mix that will fulfill your retirement needs? How will you withdraw from your RRIF to best suit your spending throughout the stages of retirement, and your desire to take advantage of tax-deferral? Speak to you us if you have concerns. The minimum amount you must withdraw is determined by prescribed “RRIF minimum factors”. In the 2015 Federal Budget, the government adjusted RRIF factors to better reflect expected inflation and long-term return rates on investment. These revised factors began to be applied in the 2015 tax year. 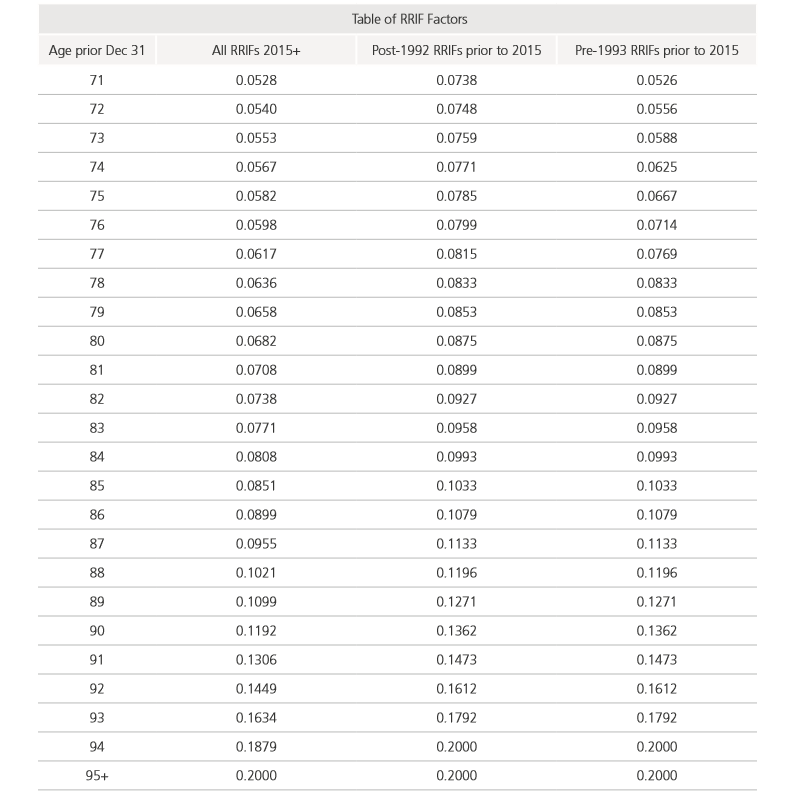 This chart illustrates the minimum RRIF factors for age 71 and afterward. Drawing from the chart above, assume that Leia converted her RRSP to a RRIF in August 2016 when she turned 71. She had no minimum withdrawal for 2016. But based on the $200,000 value of her RRIF at the beginning of 2017, Leia must take out $10,560 in 2017 ($200,000 x 5.28% = $10,560). If Leia began to withdraw from her RRIF when she was less than 71, a formula would be used to calculate the minimum withdrawals: [1/ (90 – your age on January 1st)] x the account value. So, let’s say Leia decided to start withdrawing from her RRIF at age 65. In that year her minimum withdrawal would be 4%: [1/ (90-65) x $200,000] = $8,000. Please note there is an interesting twist when it comes to age. A RRIF annuitant who is married or in a common-law partnership, can choose to base the minimum withdrawal on the age of his or her spouse or common-law partner. To take advantage of taxdeferral, the age of the younger of the two is often used. The election to do this must be made before the first withdrawal. How much is your RRIF worth? Will you choose to make withdrawals based on your age or the age of your spouse or common-law partner? Talk to us about the minimum amounts you will be required to withdraw over the years to see how they fit within your overall financial plan. The amounts withdrawn from a RRIF are taxable. You must report the income on your tax return. Generally, your tax rate when you are receiving your RRIF withdrawals will be less than the tax rate during your employment years, because your overall annual income will likely be less. Meanwhile, a “withholding tax” is imposed on withdrawals that exceed the minimum. The withholding tax is taken at source (by your plan administrator) and remitted to the CRA. It’s important to note how withholding tax is applied. This chart reflects the withholding tax rates. Naeem lives in Halifax. He withdraws $2,000 a month from his RRIF. Annually, his total withdrawal amount is $24,000. Even though his monthly amount is $2,000, his total exceeds $15,000, therefore 30% withholding tax will be applied against each monthly withdrawal. The federal Pension Credit provides some relief for retirees. You can claim 15% on up to $2,000 of your “eligible pension income”. (You may also receive a similar provincial credit.) RRIF withdrawals constitute eligible pension income, when you turn 65. That’s when the credit could be used. Additionally, you can split up to 50% of your RRIF income with your spouse or common law partner as a potential tax minimization strategy. In some instances, the Canada Revenue Agency (CRA) may require tax on a RRIF to be paid in installments. This will generally occur if the difference between your tax payable and the amount withheld at source exceeds $3,000 ($1,800 if you live in Quebec) in the present tax year, and one of the preceding two tax years. Do you want or need to withdraw more than the minimum from your RRIF? What will the tax implications be? If you have any concerns, speak to us. If you decide to spend your retirement years outside of Canada, you may be deemed a non-resident for tax purposes. If so, you will be deemed to have disposed of and reacquired all your property under the “departure tax” rules. However, property held within a RRIF is exempt from these rules. On the other hand, withdrawals from your RRIF could be subject to a 25% withholding tax at source. If the country you move to has a tax treaty with Canada, the amount of the withholding tax may be reduced. Some treaties allow for “periodic pension payments” (PPPs) at a reduced withholding tax rate, usually 15%. PPPs are defined by the Income Tax Conventions Interpretation Act (ITCIA) as a payment from a RRIF that does not exceed the greater of twice the “minimum amount” for the year and 10% of the fair market value (FMV) of the RRIF at the beginning of the year. For example, if you move to Australia, Germany or the U.S. the rate may be reduced to 15%. If you decide to reside in the U.K. the withholding tax is nil. To benefit from a reduced rate, you are required to sign a Declaration of eligibility for benefits (reduced tax) under a treaty for a non-resident person. It is to be submitted it to the RRIF-holding financial institution. Otherwise, you will be taxed at the general non-resident withholding rate of 25%. Soo-yin decides to move from Montreal to Chicago. Her RRIF is valued at $100,000. She has decided to receive her RRIF withdrawals monthly using a systematic withdrawal plan (SWP). She has decided to receive $2,000 per month. Let’s assume, based on her age that her minimum amount is $8,000. Therefore, twice the minimum withdrawal amount for Soo-yin’s would be $16,000, and 10% of the FMV of her RRIF would be $10,000. Thus, the greater of these two amounts is $16,000. For the first eight months of the year, Soo-yin’s monthly withdrawals of $2,000 will total $16,000. Hence, they qualify as “periodic pension payments” and will only be subject to only 15% withholding tax. But in September each $2,000 payment would not qualify as a “periodic pension payment” since these combined amounts surpass the amount described in the formula above that would allow them to be treated as PPPs. Therefore the withholding tax rate that would be applied to her payments from September to December would be 25%. Have you decided to take up residence during your retirement in another country? Does it have a tax treaty with Canada? How will it affect your RRIF withdrawals? Talk to us for guidance. is more than you need. You may decide to look at options for the excess. One of them may be to take advantage of the tax-free growth offered by a Tax-Free Savings Account (TFSA), by transferring the excess RRIF funds to a TFSA. While the TFSA contributions are not tax-deductible, the income and capital gains on the investments within a TFSA grow on a tax-free basis, and can eventually be withdrawn without any tax implications. Do you have a TFSA? Would you like to use it as a tax-deferral tool? Do not hesitate to speak to us about whether you would like to use a TFSA for tax-minimization. he rules involving death and your RRIF mirror the rules for death and your RRSP. Generally, when you die, the fair market value of your RRIF is reported as income on your terminal tax return, and tax may be payable for the year of your death. You can name your spouse or common-law partner as a successor annuitant for your RRIF (except in Quebec). He or she could continue to receive payments after your death and be responsible for reporting them to the CRA. You can also name your spouse or common-law partner as your RRIF beneficiary. (This is not permitted on plan documents in Quebec, but it is permitted in a Quebec resident’s Will.) The “designated benefit” of your RRIF proceeds is taxable in the hands of the surviving spouse or common-law partner. However, he or she could claim a tax deduction that may equal the amount of the designated benefit. If you name a dependent child or grandchild as your beneficiary, the proceeds of the RRIF can be used to buy an annuity with a term ending when the child turns 18. If the child suffers from a physical or mental infirmity, the designated benefit may be rolled over on a tax-deferred basis to a registered plan owned by the child, such as an RRSP, RDSP or RRIF. Whether you live in Quebec or elsewhere in Canada, you will want to ensure your RRIF funds are passed on in a tax-efficient manner. Talk to us about your options.